The Rebel Sweetheart. : Luscious Lashes with Fairy Drops Volume Burst Mascara. Luscious Lashes with Fairy Drops Volume Burst Mascara. I've been wanting to try a new mascara for the longest time. If you have noticed, I'm almost always using the Missha Viewer 270 HD Curl Mascara in my Face of the Day (FOTD) posts. Because to be quite honest, I only have two wands of mascara in my stash - the Missha, and the Avon Super Curlacious which has dried up the last time I checked. 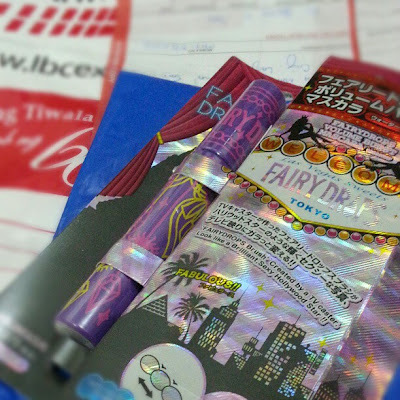 And just like a fairy godmother granting a wish, Ms. Windy of Stuff in Style sent me a message sometime last week, asking if I would like to do a review of the Fairy Drops Volume Burst Mascara. I agreed without a moment of hesitation, and the following day, this arrived at my doorstep. 'Such pretty packaging,' was the first thing I uttered upon unwrapping the package. And then it dawned on me how rusty I've become with my Nihongo. I used to be able to read Katakana with much ease - but that was years ago, when my best friend and I were totally hooked to Utada Hikaru, Koda Kumi, Final Fantasy, manga, and anime. So it's good that there's English text at the back flap. And there's an easy-to-understand, easy-to-follow, step-by-step illustration, too. Now here's how the product looks like. It comes in a pretty purple tube that screams 'kawaii'. The Fairy Drops Volume Burst Mascara has two variants - Waterproof and Film Type. This one is the Waterproof variant, which is great since I absolutely can not wear mascara if it's not waterproof. The latter, on the other hand is a water-resistant variant. Now twist the cap open and ta-da! It's the famous '3-teardrop wand' that's patented in both US and Japan. The wand that made waves all over the world. This unique wand has the capability of catching even the tiniest lashes from the roots. The lashes are then 'bitten' between the balls, creating sharp, triangular bunches. It pushes the lashes up and curls them without clumping, giving you beautiful, doll-like lashes. Just to give you a background, the one-of-a-kind Fairy Drops wand is actually the brainchild of Aya Yasuda - a Japanese sportscaster based in Los Angeles. Established in 2007, Fairy Drops has become the rave of makeup artists, beauty bloggers, and beauty junkies worldwide! And now, I totally understand why. Check out my lashes from before and after application. I know my lashes are naturally long, but after Fairy Drops Volume Burst Mascara, they're even longer, and thicker, too! To use, simply 1) curl your lashes with an eyelash curler, 2) apply the mascara by starting with the roots of your lashes, 3) slowly move the wand in an upward, curling motion. Unique, teardrop wand that easily picks up all of your lashes. Thick formulation that's neither runny nor clumpy. Lengthens and thickens the lashes without making them brittle. It's a bit difficult to remove. Soap and water wouldn't cut it. You'll need a cleanser or makeup remover for this. In my case, I use Human Heart Nature's Sunflower Cleansing Oil. It's a little on the pricey side, but you do get your money's worth. Now I'll you in on a secret. Stuff in Style sells this mascara for only Php 830! That's Php120 cheaper than the usual (Philippine) mall price. And best of all, this product ships for free! What a steal! P.S. For my friends in the US, this mascara, together with other Fairy Drops products can be bought at Sephora and Sephora.com. I'm not good with mascara. Like you I need it to be waterproof. My eyes tear when I laugh, and in addition to that, I rub them all the time. But hen at the end of the day, I have NOTHING to remove waterproof mascara with so I wake up the next day with nappy eyelashes. That aside, yours look very pretty! I'm still learning how to use Mascara. Am not apt in using it as don't use it often. Love that wand...how clever! Now I just need a fairy to make my lashes curl! You look great with it! It sure looks like a good product. Great name! Anything fairy drops must be magical;) Mascara is one of those things you can put on with nothing else, and it makes a huge difference. Sometimes, I just use a little bronzer, mascara and lip gloss, and I'm good to go. Oh, I love the name and magic wand! I don't go anywhere without mascara, and I am always on the lookout for new products. Thank you for the review! Japanese cosmetics are really great no? But they're quite expensive especially if bought in Beauty Bar. Thank God for online stores like SIS. Been hearing so much about this brand! I haven't given up with my Maybelline mascaras just because they work well with my thin and short lashes. But I shall try this, soon! Luscious lashes indeed. I've been reading a lot of raves about this product. Hmmm... Let me try to hunt for it here in Indonesia. I've never heard of this mascara. I really like the wand and unlike most people I don't like waterproof.I will have to check this out, thanks! Wow! This looks like a really nice mascara! :) I don't often wear mascara since I haven't found a holy grail mascara product yet for me. I'd love to give Fairy Drops Volume Burst Mascara a try though. Maybe it's what my stick-straight short and thin lashes have been waiting for. Your eyelashes became more prominent after applying the product.